Law enforcement has to worry about many types of threats. Police don’t just worry about conventional crime, but are effectively counter-terrorism agents as well. Of over a dozen possible threat groups, Islamic Terrorist is no longer number one. 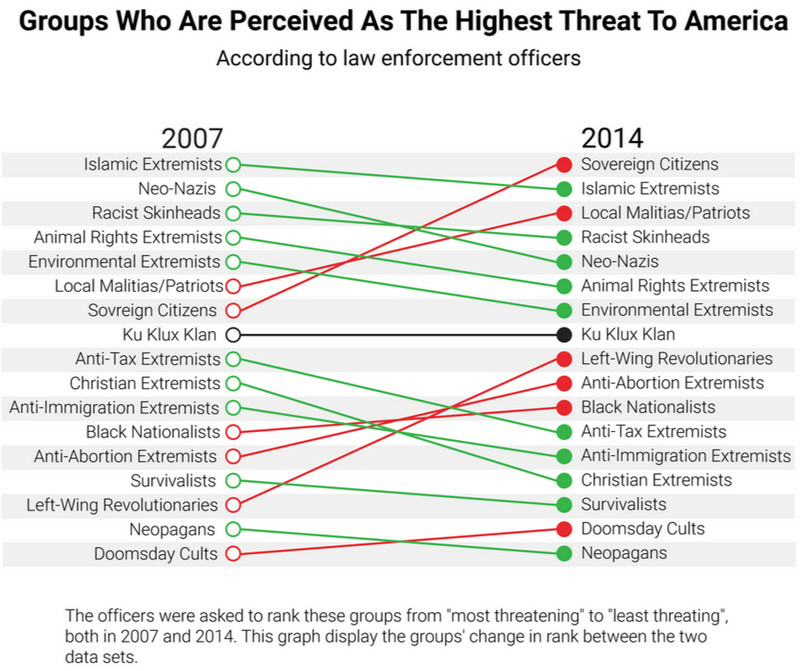 The top threat is seen as disaffected citizens, particularly the Sovereign Citizens that feel that they are abiding by the correct interpretation of government authority and that the government has strayed so far as to be something to ignore. Why follow the law or listen to the police when you think the law is unconstitutional and the authorities have no right to enforce it? The threat is worse because it comes from within and is driven by people who feel themselves to the proper authority – which in some cases has extended to attacking law enforcement. Of the remaining groups, almost all are internal, and probably greatly outnumber Islamic Extremists.